As the Chinese new year celebration draws to an end, lets focus on the dessert menu. Auspicious food still has to be on the table so I chose something that will keep the family glued together. Sticky food is meant to promote family unity. Round shaped food bring unending prosperity. Nothing fits the bill more perfectly than mochi. 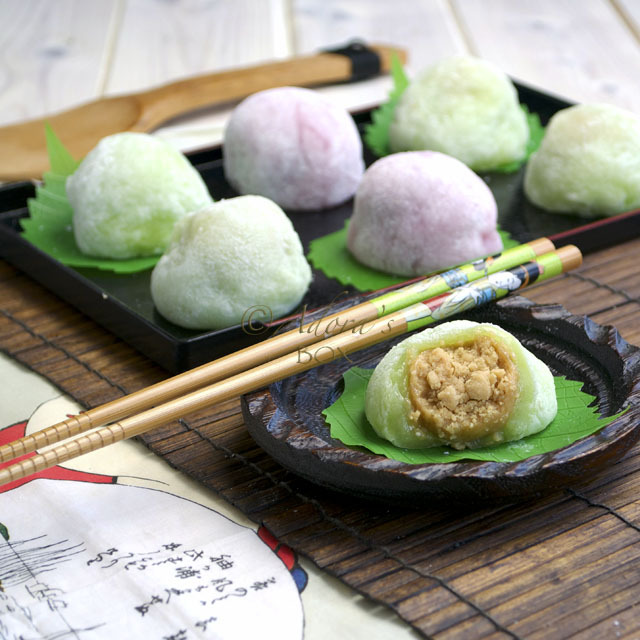 Although the flavour of this mochi is very Asian, it would also appeal to western tastes. The flavour is not disimilar to key lime pie. It is the texture that is different. Asians love the chewy texture of desserts made with rice flour. 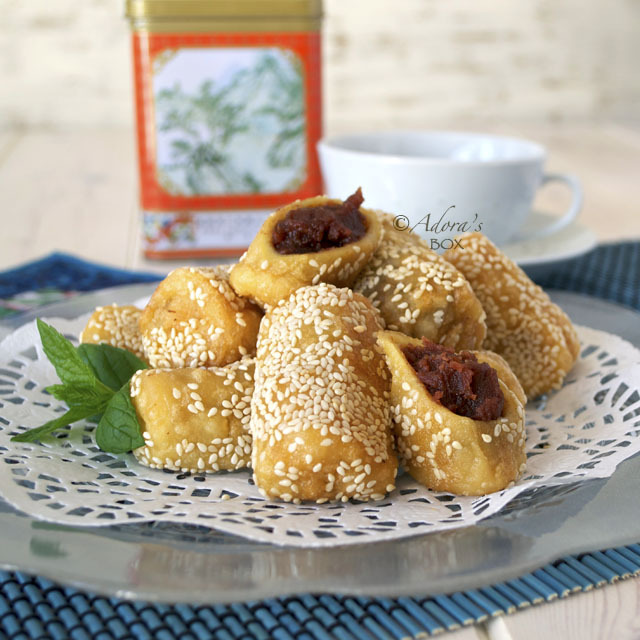 Rice flour is has a very delicate and neutral taste that makes it ideal as a carrier of different flavourings. Desserts and snacks like this are found in all the Asian countries, each with a variation that make it uniquely their own. 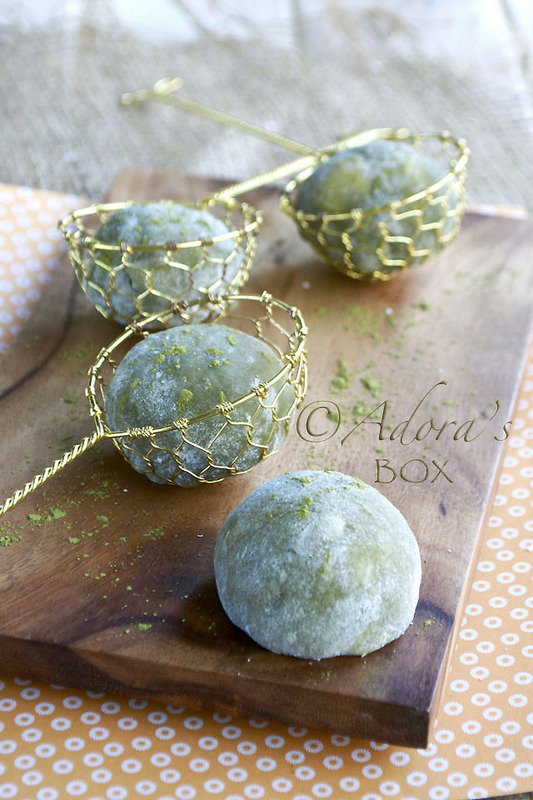 I used matcha green tea powder to colour and flavour the mochi dough. This adds a refreshing flavour that is similar to what banana leaf or pandan leaf imparts to food. As a contrast, the lime custard has a creamy richness with an added citrus zing. Mixed together, they make quite a delightful combination. Reduce the quantity of vanilla to 1 tsp. Add the lime zest when the custard is cooked. Leave to cool. Mix all of the ingredients together and pour into a greased glass container. Microwave for 7-10 minutes. The mixture puffs up when when cooked. Take the container out of the microwave and give the dough a stir to even out the coulour and texture. Using a greased spatula divide into 12 portions. Scoop a heaping tablespoon of the mochi into the mixture. Using a spatula, dislodge the dough into the corn flour and sugar mixture. This will be very sticky so avoid touching the mixture with your bare hands. Press a ball of the filling in the center of the mochi. Dip your fingers in the corn flour mixture and gently gather the four corners of the mochi to surround the filling. Roll in the powder. The mochi will not be sticky anymore and you can easily shape it into a ball. If you find that there is too much of the mochi dough, snip off the excess with scissors. Re-roll in the mochi ball in the powder and shape again. 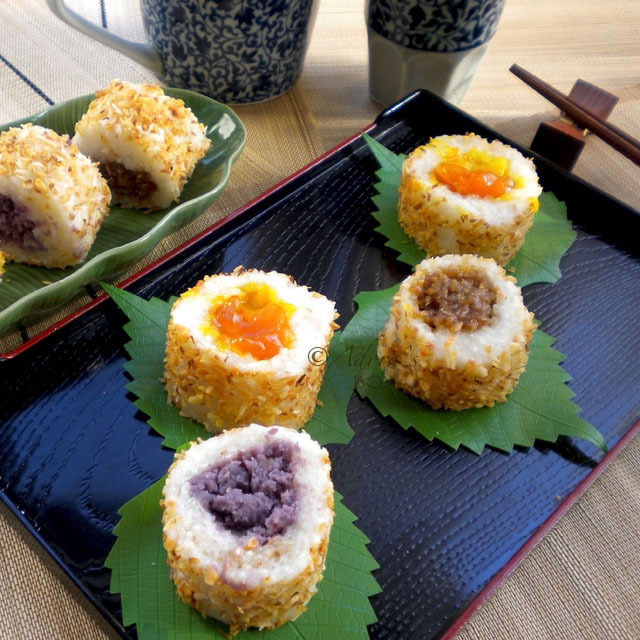 The excess can be re-mixed with the mochi dough and used again. This recipe makes 12 pieces of mochi. This mochi looks amazing! Lime custard? I'm sold! I love your photography, and I especially love the golden baskets cradling the mochi. Hi Adora! Your mochi is huge compared to those we get at the shops. 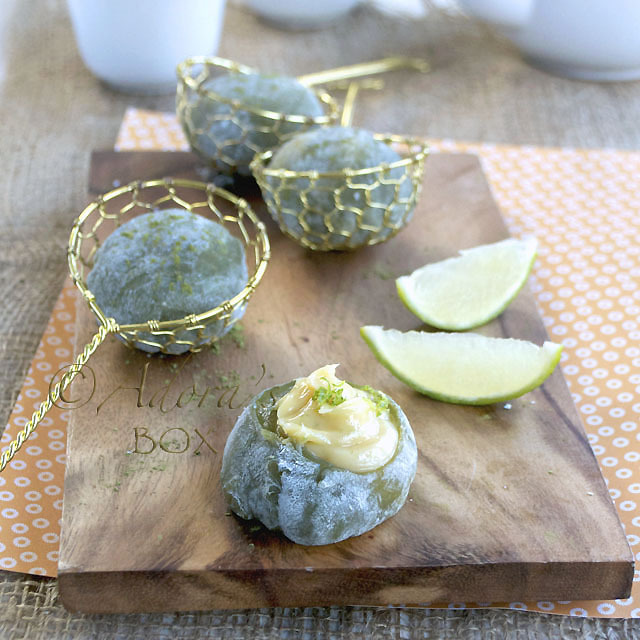 What other fillings have you tried with this mochi recipe? Hi Alvin. These are big mochis because I want lots of filling. I have only tried this combination for this dough. I have made red bean, loyus paste and peanut butter for the plain mochi. Oooo......your mochi looks very beautifully made. Wish I could have one from you. Usually those store bought ones the fillings are either red beans, black sesame, peanuts, and you made yours with custard ~ mmmm.....yum...a difference taste. Thanks Mel. Love them. My fave is the red bean paste. 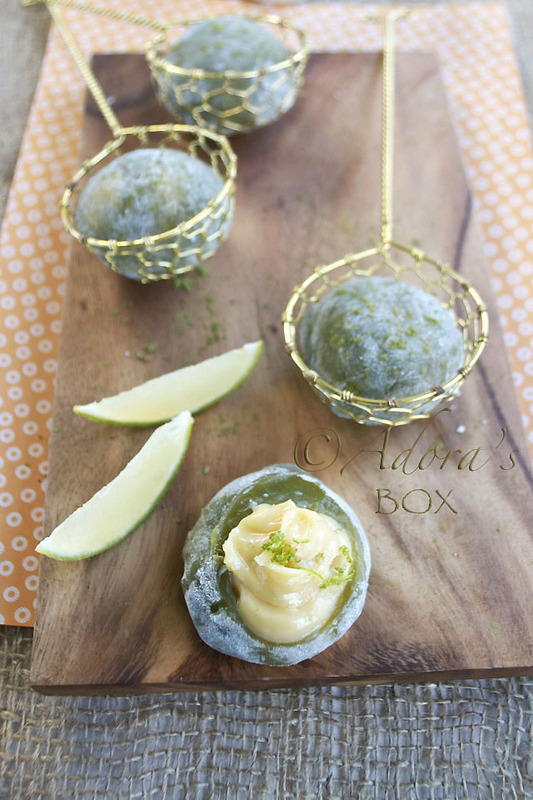 Matcha, custard filling, glutinous rice flour - I can't image that these ingredients combined wouldn't be delicious! It certainly looks delicious! I would love of bowl of these to pop into my mouth right now. They look so good! Hope you had a wonderful Chinese New Year! Thanks MJ. We had a simple CNY celebration. Good but too busy. 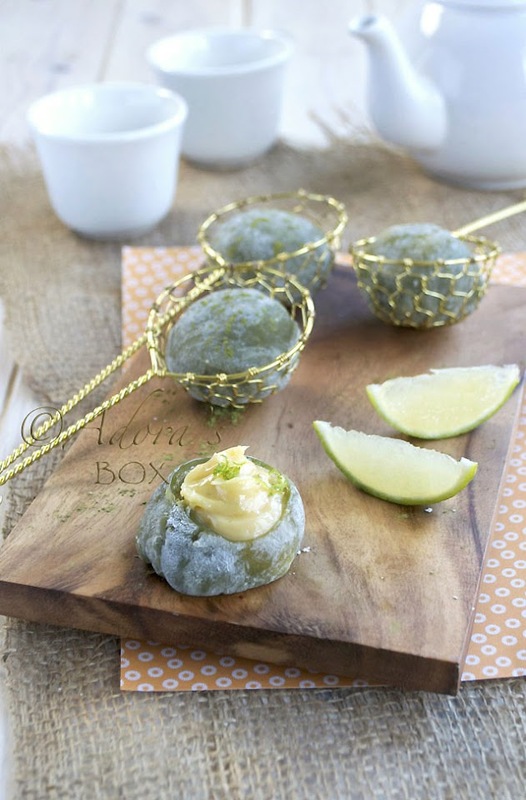 I love all things citrus and mochi with lime custard sounds divine. I will try making this some day, thanks for the idea Adora, and the photos and styling are so pretty. 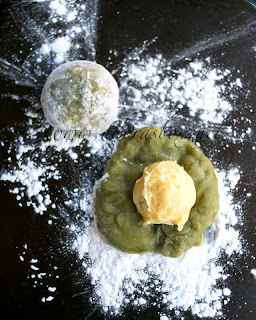 These have to be the most beautiful mochi I have seen, stunning photos, indeed! hi, if i dont have microwave, how to cook it ? can do as steam ? Yes, you can steam the mixture instead.